Fudge It: Confections by Oh, Fudge! A company specializing in confectionery and soap kind of sounds like the makings of a sitcom: the inevitable mixed-up orders, hilarity ensuing. Nonetheless, we took the brave step of buying fudge by Oh Fudge, a Graham, WA-based operation run by Ann Smith, whose Etsy shop is half comprised of fudge, cookies and sweet cake bars; the other half is comprised of Lush-esque cakes of soap which also look strangely delicious. So, were we playing with fire? Was this fudge going to taste like a stern lesson? Happily, it was more like a reward. 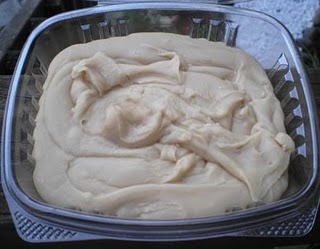 The fudge was like a cross between cake frosting and cookie dough, so smooth and rich it would eat just as comfortably from a spoon as with your fingers; the baker tells us the secret to the texture is using cream instead of milk for the fudge (which is loosely based on her grandmother's recipe). Of course if you do eat it with your fingers, you know what to wash your hands with later.